I used to keep my crochet project in the same exact tote basket! This makes me want to pull out all my leftover yarns and do something with them. I am full of admiration and am beaming it over the ether at full strength. If you could crochet said lads an Ipod then they would admire (and no, I haven't missed out the word 'cover'), but it would have to be matt black and chrome which would be very boring on the colour front. we are basket twinsies! i have the same olive green vintage basket that holds your yummy yarns! =D its my favorite!!! happy crocheting! Your colors are playing quite nicely. 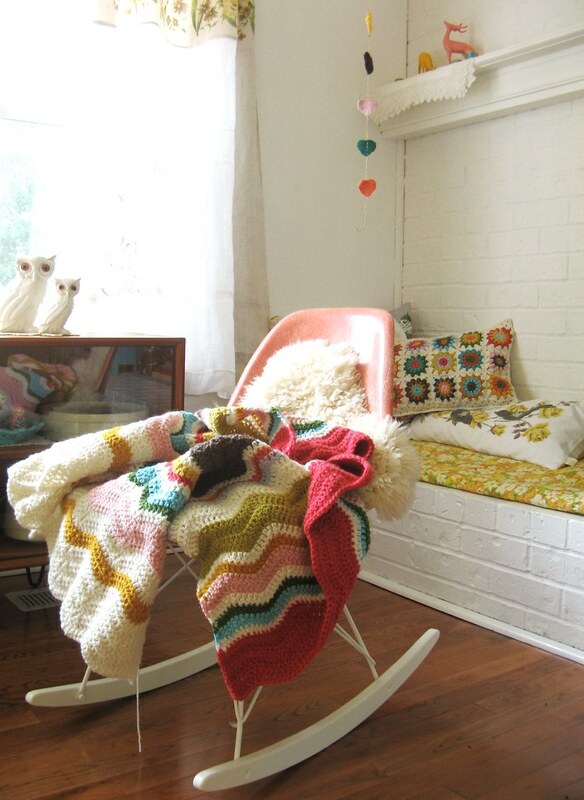 Today I am crocheting too, under my quilt of loveliness. Such bliss! Love the colors that you finally decided on. A nice thick blanket such as this is perfect this time of year. This is why I opted for purchasing my chevron blankie from the senior center this year. Oh, those colors are wonderful! I love Crochet.... but I was hoping that your third "C" was going to be "Clogs"!. J'adore la crochet!!!! J'aime la petite shed avec le critters! okay, that was probably painful, pardon moi! I love the croceht necky warmy prettie. Absolutement J'aime it! I love this pattern. We have one in the same design, cream and baby blue. Made by my husband's grandmother. My husband was wrapped in it when he was a boy and now my newborn son is wrapped up in it. So special. I hope yours gets as much love as ours has.